Joshua Henry, who created the "Favorite Son" military hero in Broadway's American Idiot, stars as one of the central figures in the case: He plays Haywood Patterson, one of young men (all of them under the age of 22) who made headlines around the country. Patterson is a focal point in the musical, and gets to sing (with his new brothers) the plaintive jail-cell number "Go Back Home," in which they ruefully speculate that "maybe times will turn." Henry was featured in the original Broadway cast of In the Heights and in the City Center production of The Wiz. He also appeared in Paper Mill Playhouse's Godspell. The Broadway cast also features Cullum (celebrating his 50th anniversary on Broadway) as The Interlocutor, Colman Domingo as Mr. Bones, Forrest McClendon as Mr. Tambo, Josh Breckenridge as Olen Montgomery, Derrick Cobey as Andy Wright, Jeremy Gumbs as Eugene Williams, Rodney Hicks as Clarence Norris, Kendrick Jones as Willie Roberson, James T. Lane as Ozie Powell and Ruby Bates, Julius Thomas III as Roy Wright, Sharon Washington as The Lady and Christian Dante White as Charles Weems and Victoria Price. The critically acclaimed production follows the lead of the script and borrows elements of the now-dead American theatrical form of a "minstrel show" — to make its social-justice points (and its theatrical ones, too). For much of the history of the form (which dates to the early 19th century), performances were acted by white men in blackface. All but one actor in Scottsboro Boys is black. 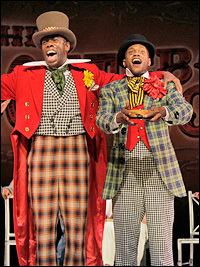 Read Playbill.com's earlier interview with Thompson on the topic of minstrel shows. Five-time Tony Award winner Susan Stroman staged such hits as The Producers, Contact and The Music Man. Book writer Thompson worked with Kander and Ebb on a revised Flora, the Red Menace and the musical Steel Pier and co-created their revue And the World Goes 'Round (all with Stroman). Thompson also adapted the script for Chicago's record-breaking revival. The Broadway creative team includes lighting designer Ken Billington, set designer Beowulf Borritt, costume designer Toni-Leslie James and sound designer Peter Hylenski, orchestrator Larry Hochman, musical arranger Glen Kelly and music director David Loud. The Scottsboro Boys is produced on Broadway by Barry and Fran Weissler, Jacki Barlia Florin, Janet Pailet/Sharon Carr/Patricia R. Klausner, Nederlander Presentations Inc./The Shubert Organization Inc., Beechwood Entertainment, Broadway Across America, Mark Zimmerman, Adam Blanshay/R2D2 Productions, Rick Danzansky/Barry Tatelman, Bruce Robert Harris/Jack W. Batman, Allen Spivak/ Jerry Frankel, Bard Theatricals/Probo Productions/Randy Donaldson, Catherine Schreiber/Michael Palitz/Patti Laskawy, Vineyard Theatre. The Lyceum Theatre is at 149 W. 45th Street. Broadway tickets ($39.50-$131.50; Premium $251.50) are available by calling Telecharge.com at (212) 239-6200 or online at www.telecharge.com. Performances will be Tuesday through Sunday at 8 PM, with matinees Saturday and Sunday at 3 PM. For more information, visit www.ScottsboroMusical.com. Each morning when the box office opens, a limited number of select-seating student-rush tickets will be available for purchase for that day's matinee or evening performance, as applicable. Tickets are $26.50 each, subject to availability and are available on a first come, first served basis. There is a limit of two tickets per patron. Cash or credit card will be accepted and a valid student ID is required. The tickets will be available at the Lyceum Theatre box office only. For performances Tuesday through Saturday, the box office opens at 10 AM. For Sunday performances, the box office opens at noon. On two-show days, both the matinee and evening performances will be available for purchase when the box office opens that day.